We’ve been in Georgetown 2 1/2 weeks now and have settled into a routine dominated by reading and relaxing as well as frequent get-togethers with other cruisers. The weather is almost always in the low 80’s and when the wind kicks up, we are well protected on our mooring ball in Hole 2. 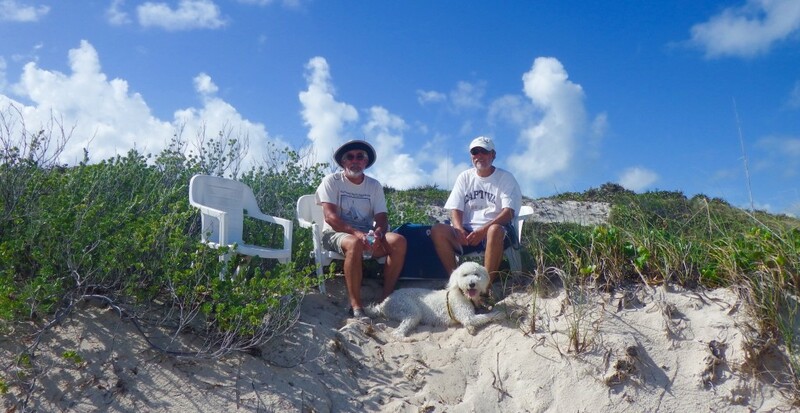 Mark and Sailor visit nearby beaches twice a day in the dinghy. 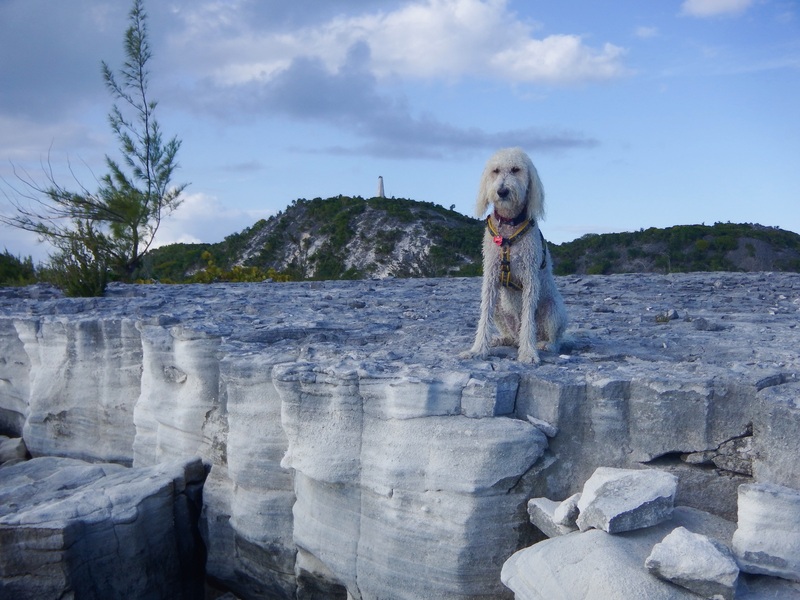 Sometimes I go with them but have been avoiding the rocky path near us up a hill to the Exuma Sound side of Stocking Island where the longest ocean beach is located. I was worried about slipping and falling on my new knees, but found it fairly easy to climb the hill and follow the well groomed sandy path to the other side. On this day, Sailor decided to race down the beach by himself. When no one is around we let him off his leash. He always comes back but he LOVES to run. We got him to pose on a piece of coral after we caught up with him. The first photo below is the small beach near us where we leave the dinghy. You can see the opening to the path that goes to the other side where the Exuma Sound beach is located. 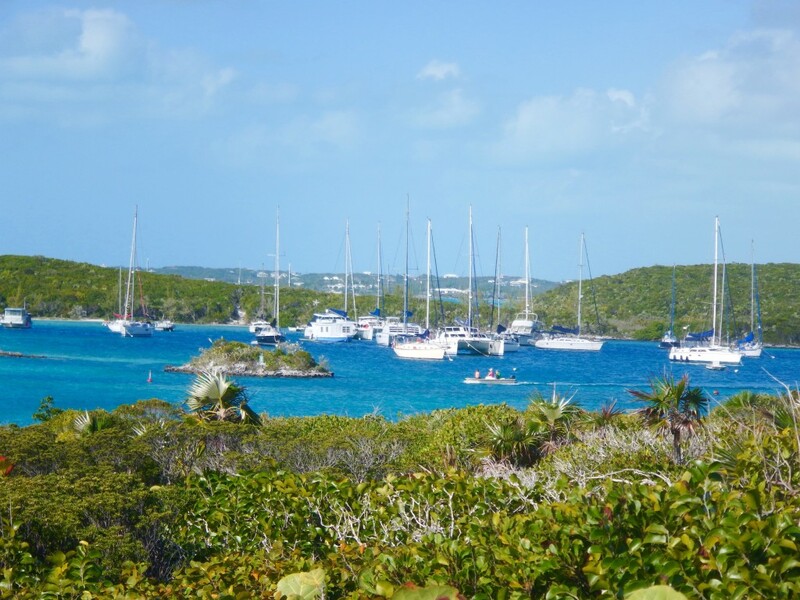 Our favorite place for swimming in Elizabeth Harbour is Flip Flop Beach, which is a dinghy ride towards the north end of the harbor. On the harbor side the water is shallow and very warm for swimming. Sailor prefers to swim out to us and then makes one of us hold on to him so he can be with us but not overexert himself. Spoiled dog? Perhaps. 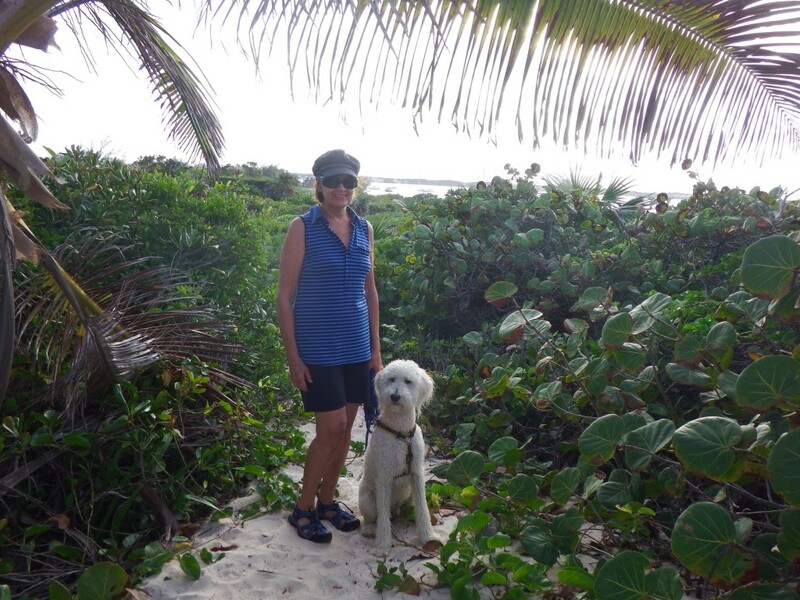 Before our swim, we followed the path from Flip Flop Beach to the Exuma Sound side and had a nice walk with Tom and Cathie (Interlude) down that beach. Then we relaxed for awhile in several chairs someone had left behind. There are some nice snorkeling areas in the harbor which we’ll visit soon. Last year we had strawberry and tomato plants, but this year it’s just tomatoes. I miss the fresh strawberries, but couldn’t find any plants before we left. The tomatoes are starting to ripen now. 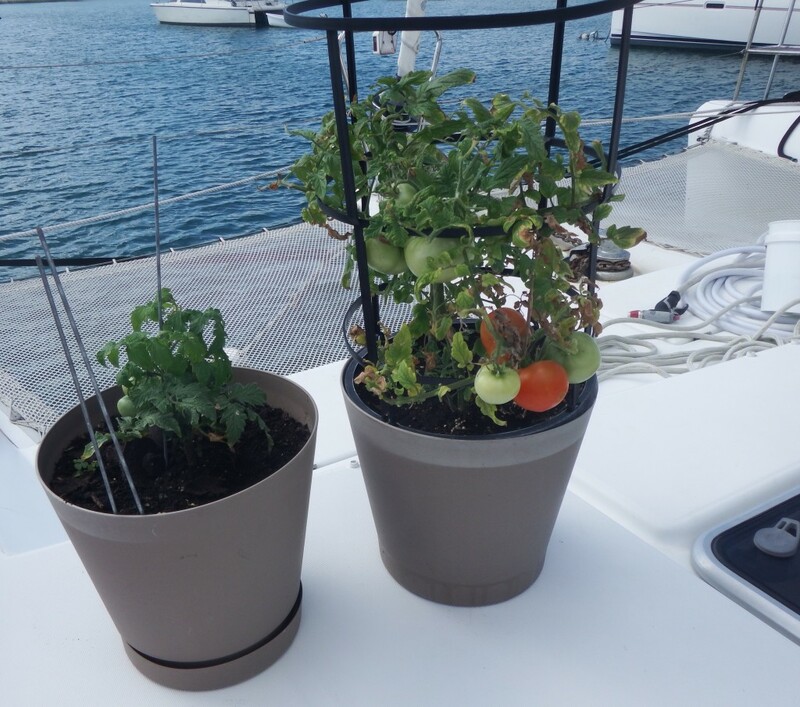 It’s easy to find tomatoes to buy in The Bahamas. They are $1 each at Exuma Market but sometimes aren’t very tasty. A local man comes to town and sells vegetables from his garden twice a week, but lately his tomatoes were mostly green and $4 for a small bag. Our tomatoes are always going to taste better than what we could buy. The smaller plant has cherry tomatoes. 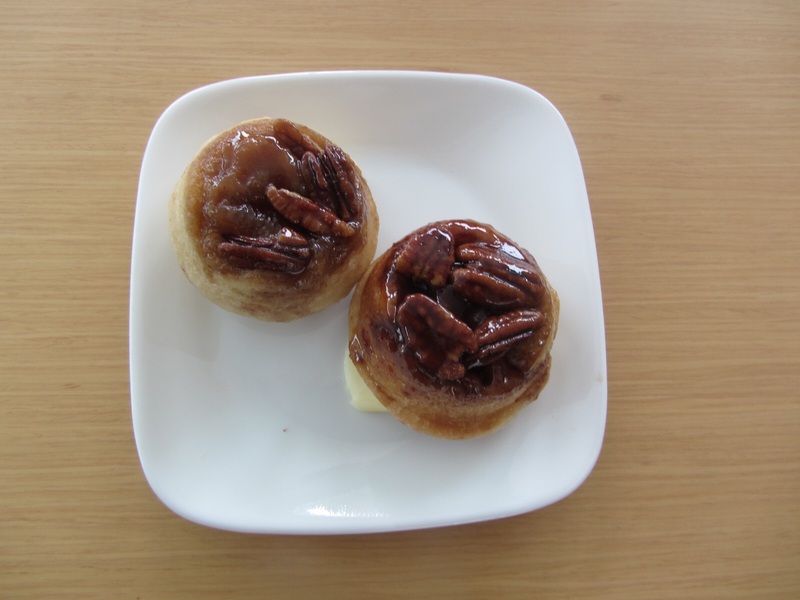 This weekend I made caramel rolls using my mom’s overnight roll recipe. We freeze them and thaw a few to eat a day so they last several weeks. It’s difficult to find homemade bakery items other than bread here so we have to make our own. In past years there was a Bahamian woman who would bring bakery goods to town several times a week and set them up on a table next to the Exuma Market, but apparently she has retired. I think we have met more cruisers in the last two weeks in Georgetown than we have in our entire past three trips to the Bahamas. The two main reasons are we are in Hole 2 with friendly neighbors and we have been playing Texas Hold’em. Yesterday we went to a bonfire get-together on one of the small beaches in the Hole. About 20 Hole 2 cruisers were there. Everyone brought their own meat to cook over the fire and something to share. We had people coming over to play cards last night so just went to visit and didn’t eat this time. It seems like the Hole 2 beach get-togethers are weekly events. 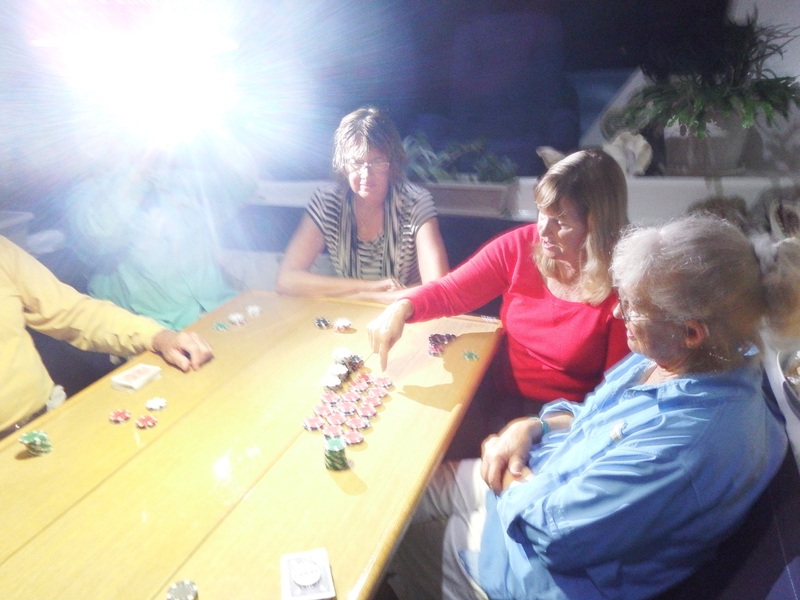 I have learned to play Texas Hold’em Poker, a very popular game here. We play two times a week at the St. Francis Restaurant and Resort. It costs $5 to play and the top three winners split the pot. There are three tables of nine or ten playing, but later in the season there will be more tables. Some of the people are here for a week or two at the resort, some live in houses, but most are cruisers. We have also been hosting games with a few other couples on Saturdays on Seas the Day, mainly because we have a big table in the salon and another in the cockpit. We also play Mexican Train dominoes with Cathie and Tom occasionally. The photo below was from last night as we were “chipping up” when we exchange our smaller chips for thousand ones. Unfortunately the hanging lamp over the cockpit table caused a glare in the picture. Cathie (Interlude) was helping Jean (Winterlude) count her chips. Obviously Jean was having a good night! I only had a few of the thousand chips at that time, but ended up coming in second and Jean won. There are many other activities going on in Georgetown. Every morning at 8 am we can listen to the Cruisers’ Net on VHF channel 72 to find out what is happening. The Net lasts 15-20 minutes with lots of information besides activities. Cruisers can ask for help, offer items for sale or trade, introduce themselves if they just arrived, hear the weather report, etc. Local businesses also talk about what they have to offer. Last night there was a free outdoor country western concert in town with US Grammy nominated singers and a Canadian who was their Entertainer of the Year. Also tonight the St. Francis is hosting their weekly Trivia Night where teams complete. A yoga instructor has classes on the beach every weekday morning, but I haven’t gone yet because I am not supposed to kneel therefore I can’t get on the ground. Beach Church is held on Volleyball Beach Sunday mornings. 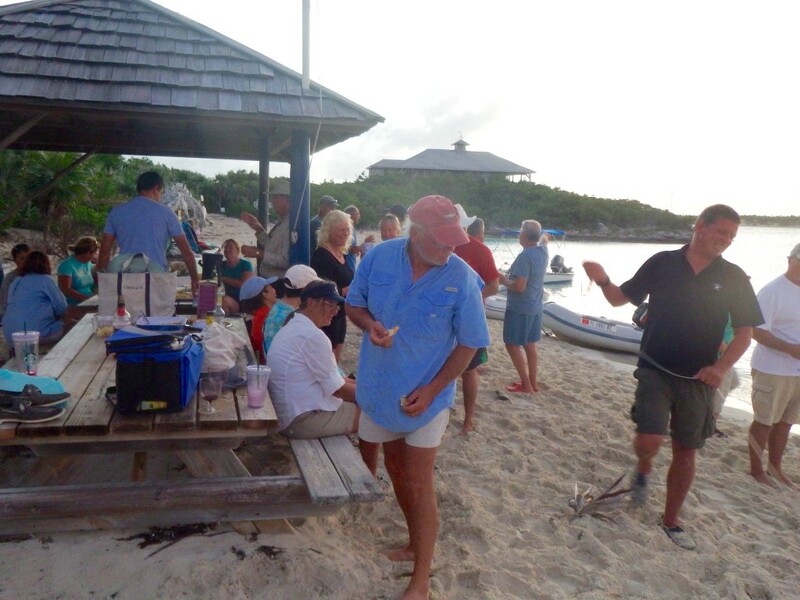 A very entertaining local historian gives talks every Sunday afternoon about The Bahamas. At 2:00 every day, people meet on Volleyball beach to play games and visit. When Regatta starts in mid February there will be more activities culminating with a sailboat race around Stocking Island and another one in the harbor. The nice thing is you can do as little or as much as you want here. You can be around lots of people or go someplace by yourself. This entry was posted in 2014-2015 Bahamas Cruise, Living on a Boat and tagged Baking, Caramel Rolls, Georgetown, Hole 2, Swimming, Texas Hold'em on January 25, 2015 by Jan.
Two days ago we moved from an anchorage in Elizabeth Harbour to a mooring ball in what is called “Hole 2.” There are several other mooring fields, one where boats are stored without people on them and another is nicknamed “The Fruit Bowl” because many of the boats have fruits in their names, like Pineappple House and Cantaloupe. There are a few houseboats here, which obviously don’t make the trip back and forth from the States. Hole 2 is very protected from all directions so even in high winds we barely move. On the day we arrived the wind got close to 30 kts and we didn’t feel it in here, but out in the harbor boats were bouncing around. Below is a photo of Hole 2. A narrow exit to another mooring field and then to the harbor is near where the dinghy is headed. We are located in the center of the back. Most of the boats moored here are empty right now. Some owners fly down and either haven’t arrived yet or come and go throughout the season. Behind us through the bushes you can see a bit of the water in the large Elizabeth Harbour. We can take our dinghy about 80 yds to a tiny beach in the mooring field where there is a very short path over a small hill to an area called “Honeymoon Beach,” one of many sandy beaches in the harbor. This means when the wind is blowing and the waves are crashing in the harbor, we can still get Sailor ashore easily because the water in here will be calm. 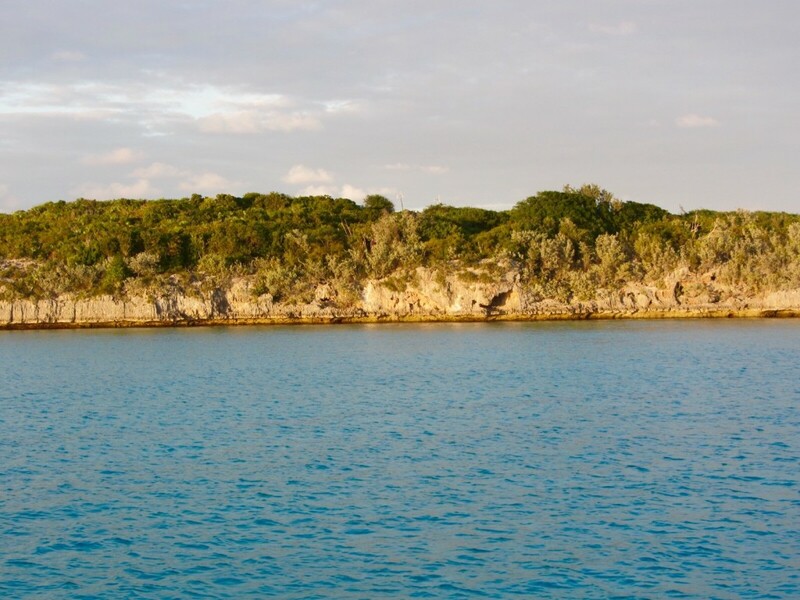 Most cruisers will say that the only mooring balls you can trust in The Exumas are the ones in the Land and Sea Park. However, these are very secure. In fact, about half of the boats in Hole 2 stay here all year, through hurricane season. The monthly cost is $300, the same most mooring fields charge in Florida. Of course for that fee here, we don’t get a nice shower, free wifi, a captain’s lounge with cable TV, and a laundry like we would in the States. However, not having to worry about the weather is worth every penny. A pumpout boat comes through the anchorages and mooring fields three times a week. While everyone in the harbor doesn’t necesarily use it, the boats in Hole 2 do, so the water is clean. 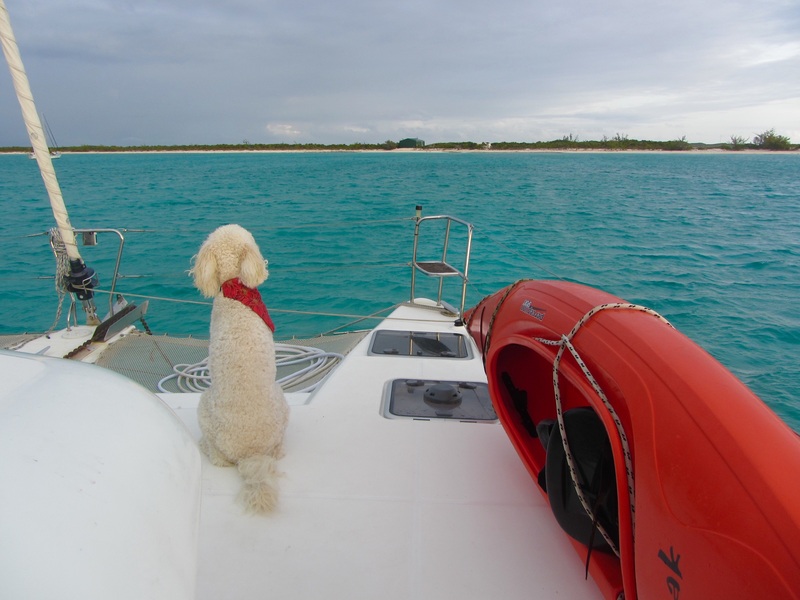 We are just a short dinghy ride from the St. Francis Resort on Stocking Island which has a nice restaurant and bar. 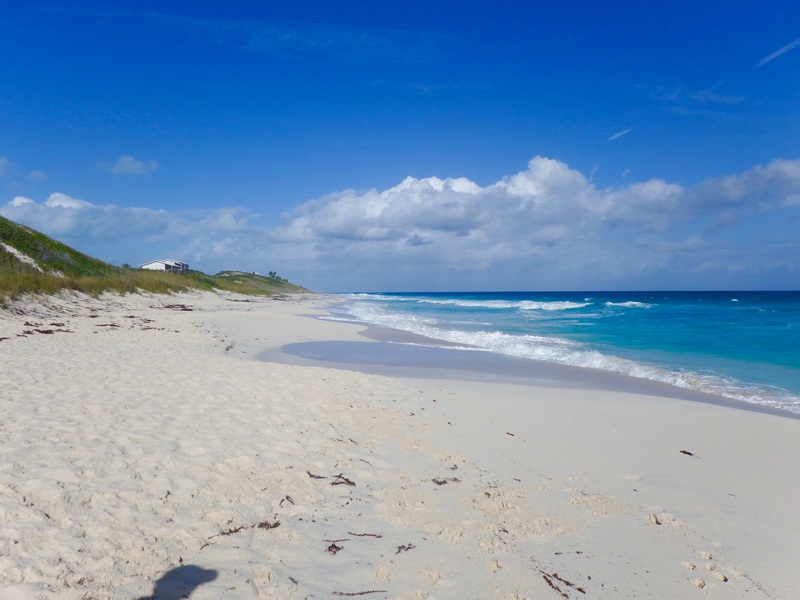 Right behind the restaurant is the long sandy beach on the Exuma Sound side of Stocking Island. 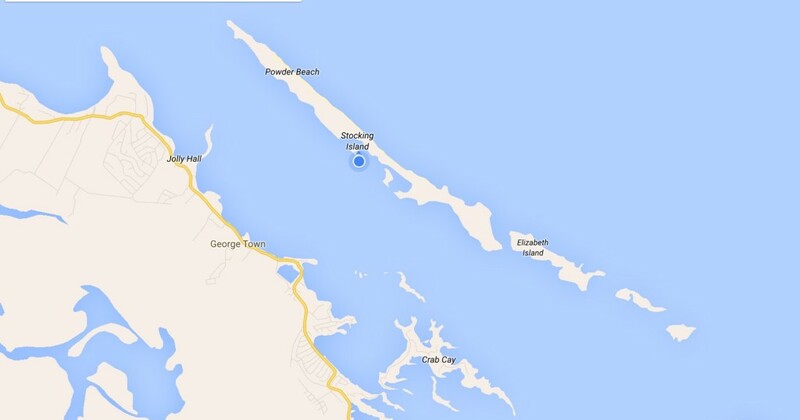 Below is a screen shot of a Google Map of Elizabeth Harbour with George Town on the west side and Stocking Island on the east side. The Exuma Sound, which is part of the Atlantic Ocean, is on the far east side of the map. The blue dot is where we are moored. I guess in the States we would call Stocking Island a “barrier island” but the other land mass is a much larger island, Great Exuma. Thursday night we had dinner at the St. Francis with Cathie and Tom (Interlude) who are also moored in Hole 2 and traveled with us from Florida to George Town. All of us are happy to be here and quite honestly taking a deep breath and relaxing. As nice as it was to visit all the places we stopped at before we reached here, we were always one step ahead of the weather, so couldn’t enjoy ourselves as much as we would have liked. In the Spring when we head north, the weather will be more settled and we can enjoy stopping at the small islands along the way. We also plan on heading a bit farther south after we leave George Town, at least to Long Island which is a short day sail away. We plan to stay here through the George Town Regatta at the end of February. Sailor went to four diferent beaches in the first 48 hours we were here. There are many more to explore and they are usually empty. Cruisers staying in Elizabeth Harbour usually go to Volleyball Beach where the activities, other than volleyball, include dominoes, yoga, beach church, speakers, meeting new and old friends, basket weaving (using palm fronds) and much more. 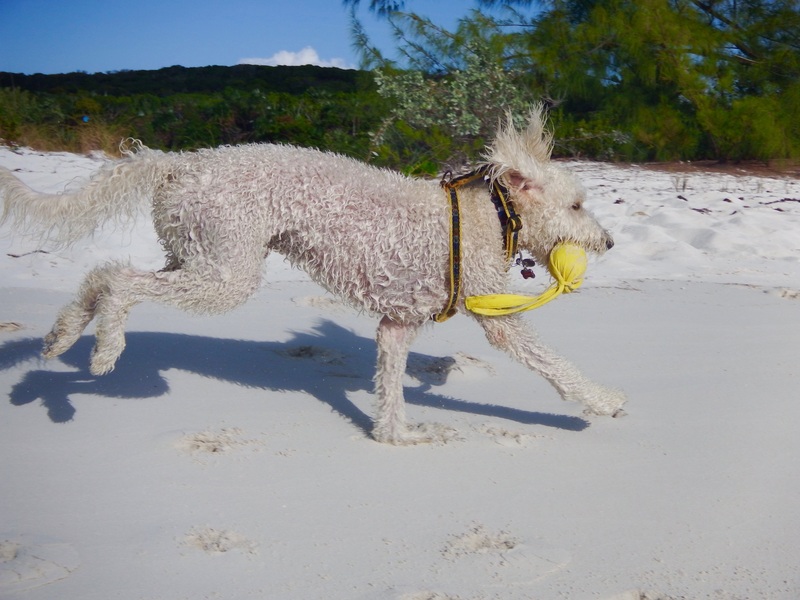 Below is a picture of Sailor on the Exuma Sound beach yesterday. Another dog from the mooring field was there to play with him for awhile, but mostly he ran up and down the deserted beach. Today we are making our first dinghy trip across the harbor to Georgetown. We’ll pick up some fresh fruit and vegetables at the well stocked Exuma Market. Every time we go to town we take our four 5 gallon water jugs and fill them at the dinghy dock. 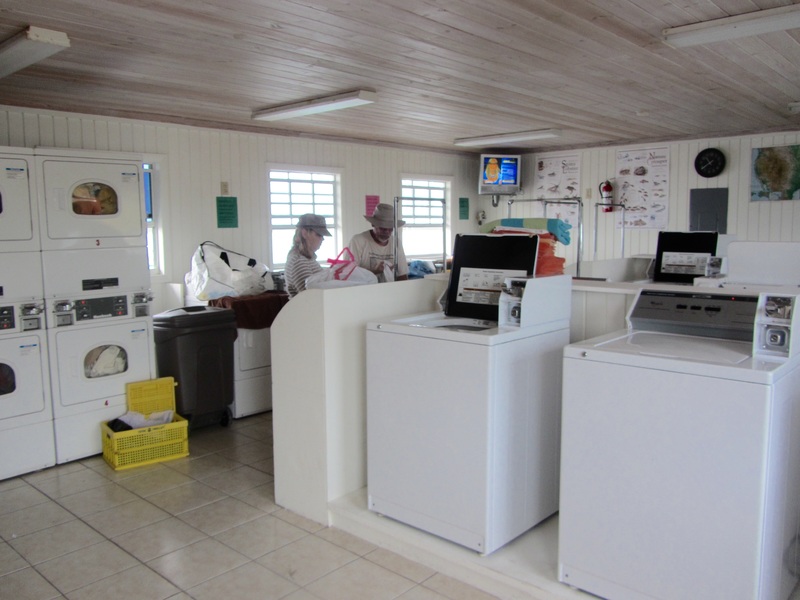 While here we will give our watermaker a rest and use the free RO (reverse osmosis) water provided by Exuma Market. This entry was posted in 2014-2015 Bahamas Cruise, Georgetown on January 10, 2015 by Jan.
After being treated to a boat wash courtesy of Mother Nature, we left Blackpoint Tuesday afternoon and motorsailed to Cave Cay. 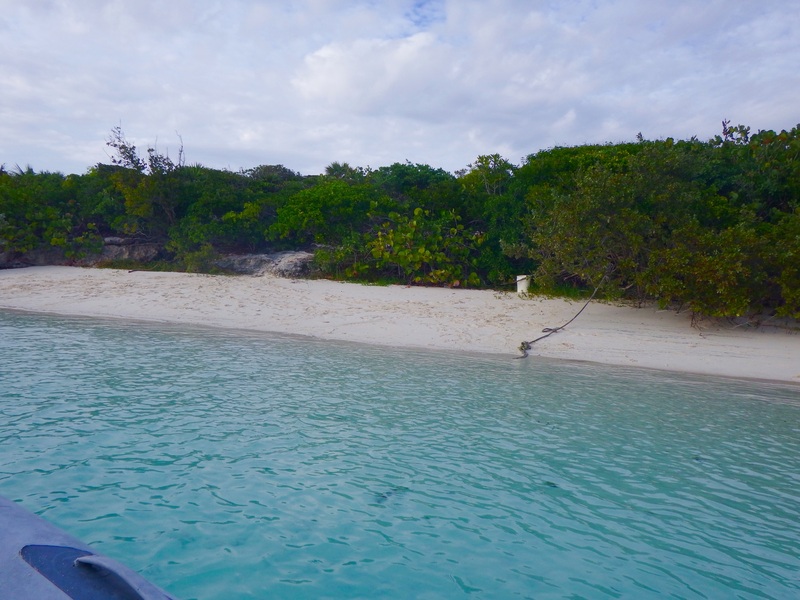 We anchored near Cave Cay Cut, which was where we were leaving the shallow waters of the Banks to go out on the deep Exuma Sound on Wednesday. 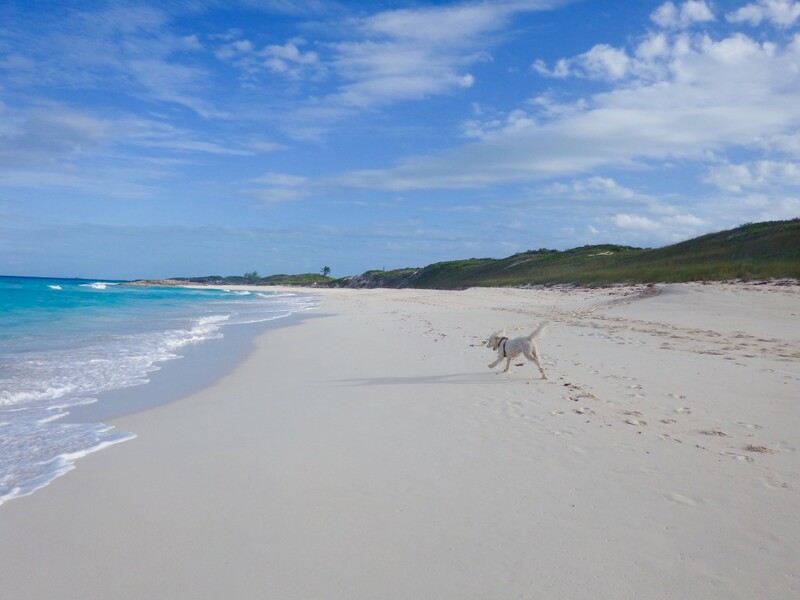 We always try to take Sailor for a beach run when we arrive at a new island, but Cave Cay didn’t look too promising. The shores near us did not have any beach, just rocky cliffs. Still, Mark took off in search of a sandy beach and found a great one. 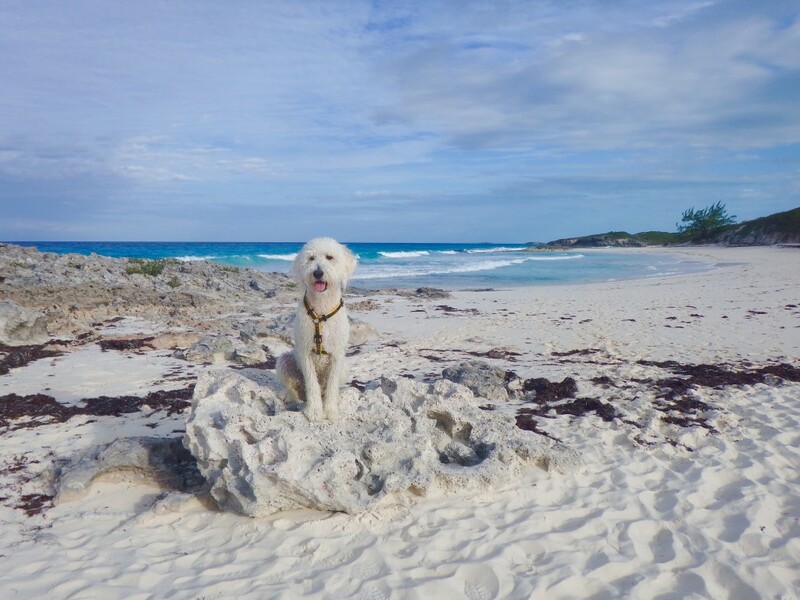 Posted signs said “private” but all Bahamian beaches are public up to the high tide line, and Sailor always stays on the edge of the water or in it. Cave Cay is a privately owned island with a marina and a resort. 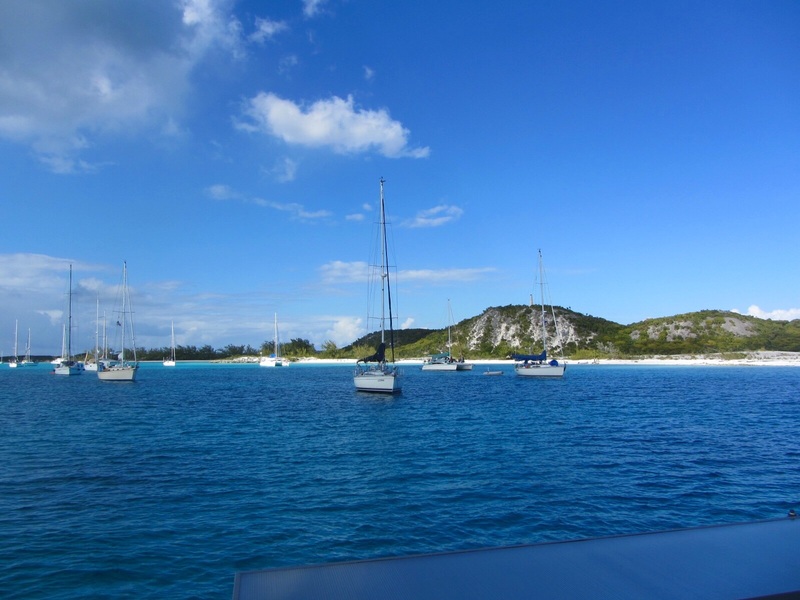 At 0750 today we left the anchorage, motored the short distance to the cut and headed south on the Exuma Sound with less than 5 kts of wind out of the NE. Needless to say, we did not bother to try to sail. There were quite a few boats out on the Sound ahead of us and a storm brewing behind us, so we went a little faster than our normal cruising speed. We counted 18 boats as we passed them and more came out of the cuts behind us. It’s not that we are that much faster than the boats we passed. We just chose to use more fuel in order to reach George Town before the storm clouds. 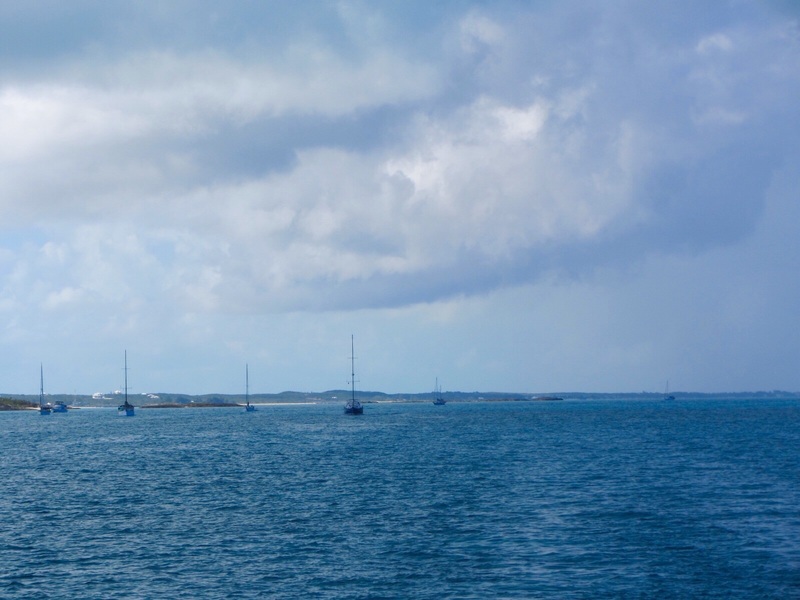 The photo below shows some of the boats following us into Elizabeth Harbor. By 1350 we were dropping our anchor in the Monument anchorage. Tomorrow we will pick up a mooring ball in Hole 2, a very protected hurricane hole in Stocking Island. Our friends Cathie and Tom (Interlude) always stay there and we know that we won’t have to be concerned about the weather. There are many anchorages in Elizabeth Harbour and when a storm or heavy wind is predicted, boats move to different anchorages for protection. The harbor sometimes gets very choppy and the current is strong. There have been times when we couldn’t get into the dinghy. We decided that due to the fact that I am not fully recovered from my knee surgery, it would be best to be in a situation where I am not constantly trying to stay balanced. 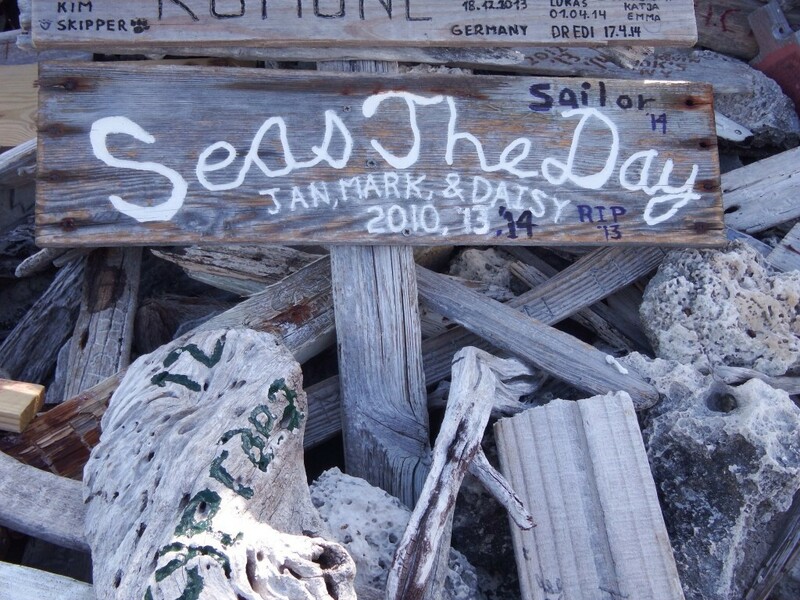 I discovered since we left Stuart on December 19 that on days when the boat was rocking a lot, my knees became sore. Sailor has become more comfortable on the boat as the days have passed and when it isn’t rough, he likes to stay at the helm. 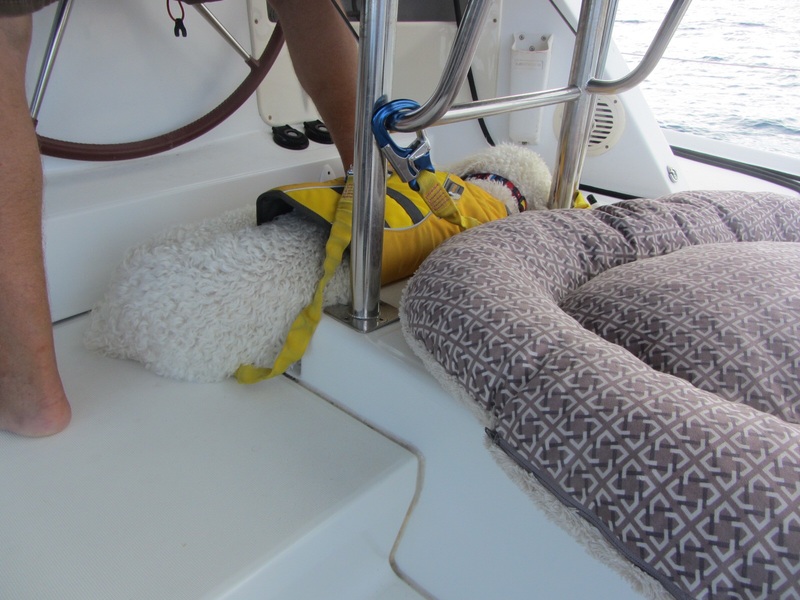 However, on the days when the boat bounces around in the waves, he wants to be inside, usually in a bed with me next to him. Today was a good day. 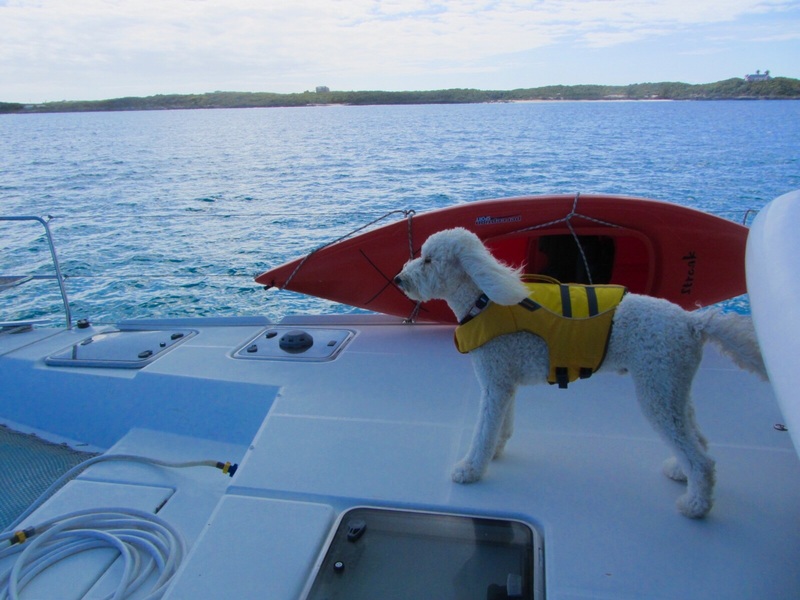 Of course, as soon as he saw and smelled land in Elizabeth Harbour, he was ready to come to the foredeck to check it out. We undo his tether when we approach land. He knows that soon after we stop, Mark drops the dinghy and they are off to play on a new beach. 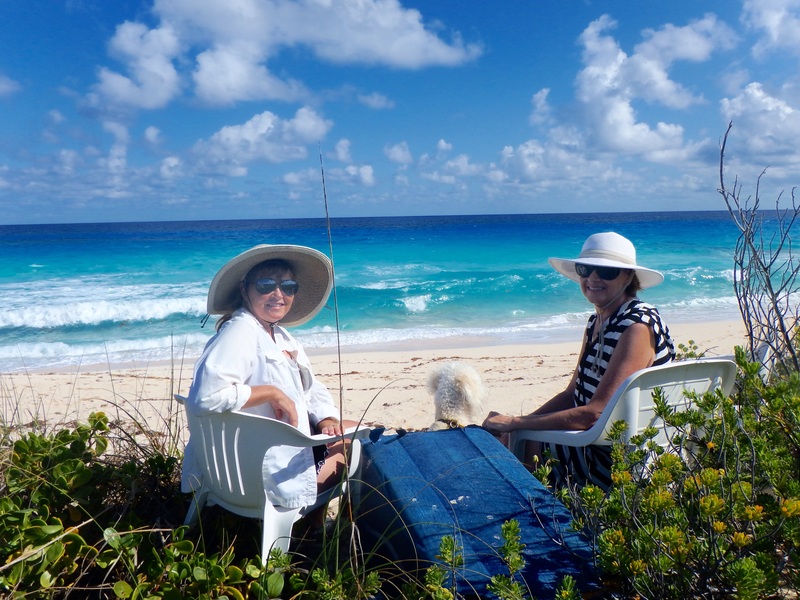 Once we are in Hole 2, we will be a very short calm dinghy ride to shore where we can go over a hill and be on a long sandy Exuma Sound beach. 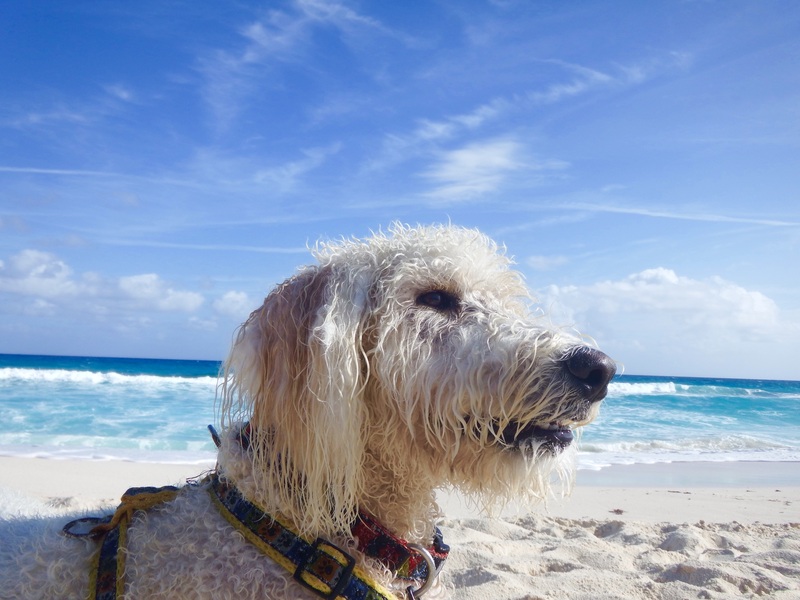 Today, Sailor enjoyed another new beach on the harbor side of Stocking Island. The monument in the background is how this anchorage got its name. This is the earliest we have arrived in George Town, mainly due to getting good weather windows along the way. Except for Sunset Lake in Florida and Warderick Wells where we waited for weather to pass, we never stayed more than a night at any stop. People either love or hate Georgetown. Yes, there are a lot of boats here, but if you don’t want to anchor amongst them, there are plenty of anchorages where no one goes. On one side of the harbor is the city of Georgetown. Of course, this is where you go to shop. 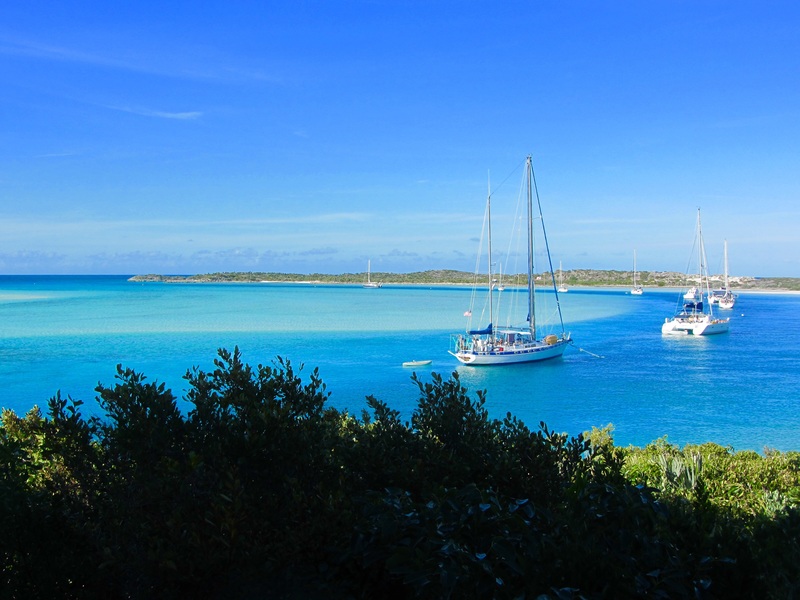 The Exuma Market has built a large dinghy dock and provides free water to cruisers who line up at a hose to fill their jugs. The market is the best since Nassua, large and well stocked. There are at least seven roomy anchorages on the George Town side. On the Stocking Island side, where we are, there are also many anchorages, but these are the populated and crowded ones since they are the most protected from the prevailing winds. Lots of activities here to join or ignore. Someone just came on the VHF radio announcing a meeting of the ARG (Alcohol Research Group) this afternoon. All interested parties are to gather their research materials and meet in the harbor in their dinghies to raft together and drift. Mark chose to do his own research with a rum punch in the cockpit after returning from Sailor’s beach run. As I said, some people love it here and some avoid George Town like the plague, but the good news is there are a variety of things to do, everything you need is available in town, the phone and Internet signals are strong, the scenery and water are beautiful and that makes for many choices. 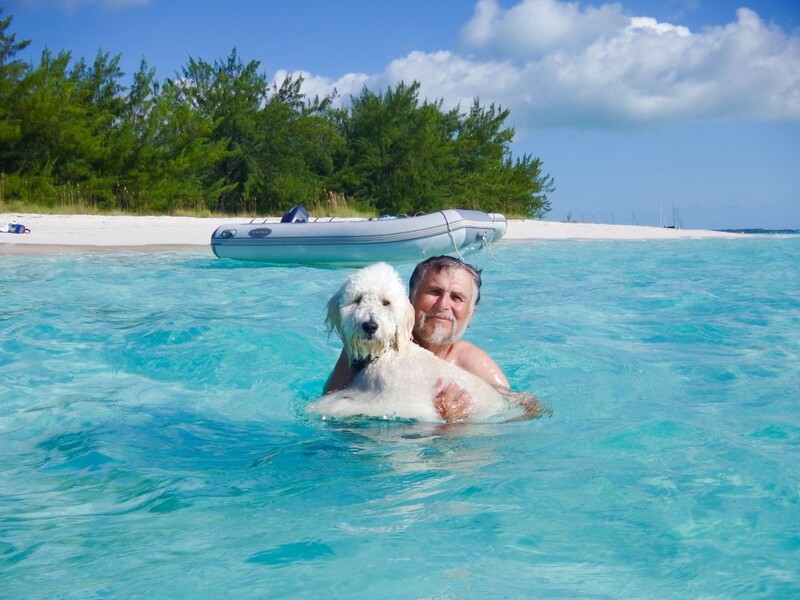 This entry was posted in 2014-2015 Bahamas Cruise, Sailing and tagged Georgetown on January 7, 2015 by Jan.